One or two documents recovered from your bin are all that is needed to steal your identity and this applies to your business and its documents too. Around 89,000 people in the UK are victims of some form of identity theft every year. This may cause you to rethink how you dispose of important and personal documents. 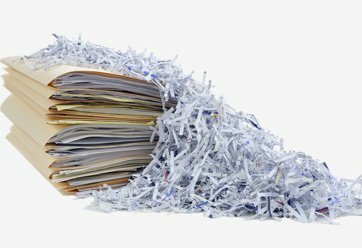 So we have compiled a helpful list of to help you shred and dispose of documents safely. DON’T just throw your documents in the bin intact. This is the easiest way for identity thieves to get hold of your information. It is almost like asking someone to take those documents off you. DON’T rip your documents into easily repaired pieces. While you may think that ripping your documents up is an effective way of preventing identity theft, it will usually take no time at all for a perpetrator to piece that document together again, like completing a simple jigsaw puzzle. DO use a shredder on personal and important documents. If you don’t own a shredder yourself and are wondering where to shred documents, offices sometimes give access to shredders to destroy sensitive data, particularly documents that are relevant to the company. Aside from this, if you have some documents that you would prefer to have a copy of, you can have your documents scanned to digital format and have the original copies shredded and securely disposed of. DO use a cross shredding shredder for extra security. The cross shredding technique makes it almost impossible to piece the document back together and complete sentences cannot be read on the shreddings making your disposal all the more secure. DO dispose of shredding securely. You don’t want to end up like the members of Nassau Police Department. During Macy’s thanksgiving parade last year, the confetti exploding over onlookers turned out to be shredded confidential documents from the Police Department. It had also not been cross shredded meaning information could still be read off the shreddings and potentially pieced together. There is nothing more important than your own personal security so take steps to prevent identity theft and shred your personal documents. If you don’t have the facilities yourself then hire out a paper shredding services or have your documents scanned to digital format and disposed of in on site shredding services. Which documents need shredding is usually different from person to person. If you want to dispose of a document and you think it contains personal information, the best thing to do is to shred it. At Pearl Scan, we offer secure document shredding as aftercare for your document scanning solutions. Our paper shredding service will ensure that your documents are safely and securely disposed of to give you the best identity theft protection. For more information on our document scanning process please call us and speak to one of our friendly and helpful team.